4 pics one word 5 letters. Arm with a crank. Football table. Fuse ball table. Gears. Silver box with crank. Coffee mill. 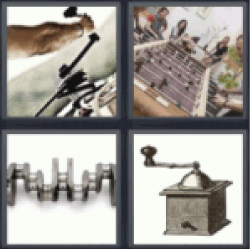 Find the 4 pics 1 word answers you need and still have fun with the game that has hooked millions of people. 4 pics one word 5 letters.